Annette's Creative Journey: Compendium of Curiosities III Challenge Begins! Compendium of Curiosities III Challenge Begins! Hello and welcome to the first of MANY Compendium of Curiosities III Challenges. Are you planning to play along with the challenges? Do you have your CC3 book? Are you curious to know the first challenge? You can check out all the official details on the Studio L3 blog. Then hurry and get your copy of Tim Holtz's Compendium of Curiosities Vol. III. Craft stores and scrapbook stores have it, but if you'd like a SIGNED copy from Tim himself, go here and order yours ASAP. The first challenge "Paint Marbling" can be found on page 43 in the book. While I can't show you the technique itself (we'd love it if you'd buy the book and try it for yourself instead) I CAN show you my creation with the technique included. The tag on my card has a very soft Paint Marbling effect, which works well with the new Wallflower paper stash in the background and the Nature Walk stamp set from Stampers Anonymous. 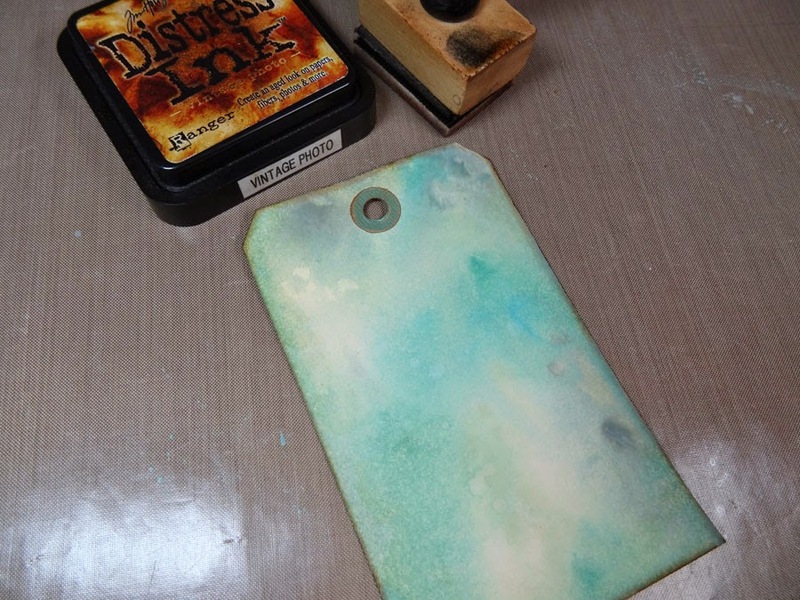 After doing the Paint Marbling technique on my tag, I swirled some Bundled Sage and Tumbled Glass Distress Inks onto the edges and a bit in the center. Oh, and I am LOVING the new round blending tools! Added a bit of Vintage Photo around the outer edges for a finishing touch. My Kraft Core card base, folded, measures 5" x 6", so I cut a piece of the Wallflower paper 4 3/4" x 5 3/4". 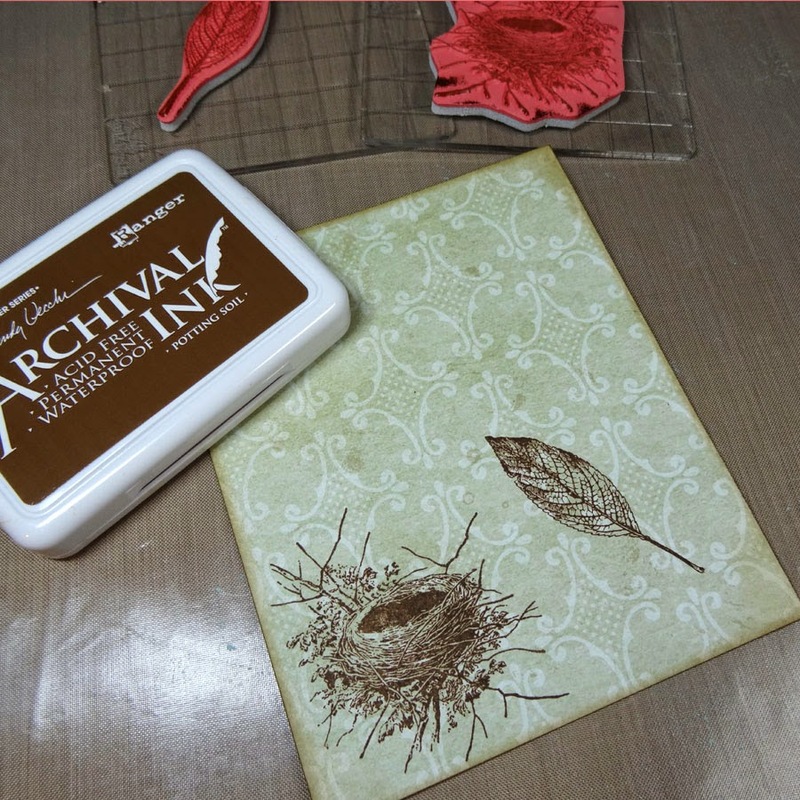 Then I stamped the nest and feather with Potting Soil Archival Ink into the position I liked. Since I want to stamp the same images onto my tag and have them line up with those on the paper, I first laid a piece of vellum between the two, positioning my tag as desired, then stamped the images directly over the previous ones. The vellum serves as a window for lining up my stamping while also masking off the ink so it doesn't get on my paper below it. Now I have this. 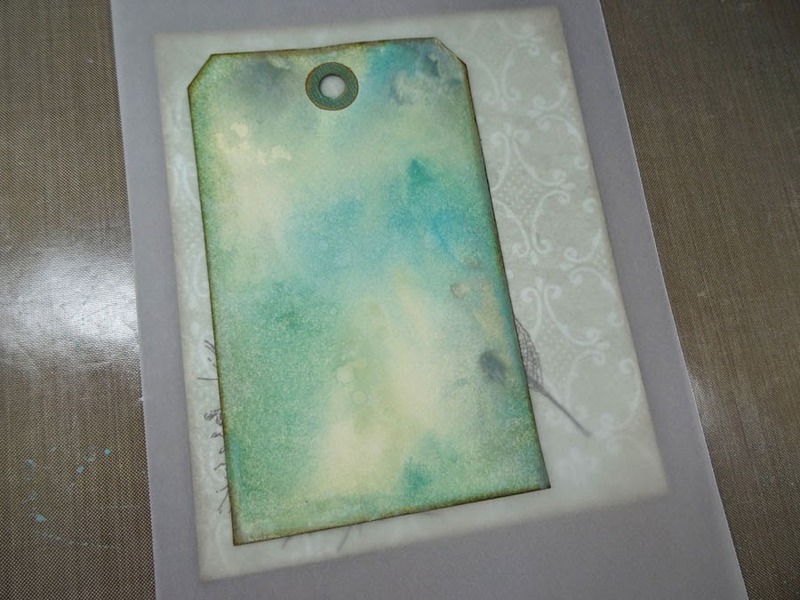 The tag will be positioned over the paper and the stamped images will appear to continue from the tag to the paper. From the Nature's Elements clear stamp set, I stamped a small kraft tag, added some Vintage Photo to the edges, another bit of Wallflower paper along the bottom and a reinforcer to the hole using the same colored Kraft Core card stock as the card base. I wanted to add some small flowers to my card, however all I had were these print pink ones (left). A little too bright! So I grabbed my Picket Fence Distress Marker and colored over the paper flower which muted back the pink nicely (right). And it gives a more shabby look, which I love. Then I started to assemble my card. As you can see, I stamped another feather along the right edge. When I started adding the Shabby Buttons, twine, flowers and leaves, I had eventually covered up my stamping technique I showed you before. Oh well. Whatchagonnado? I like it better now with the embellishment cluster anyway. A strip of tissue tape along the top adds a bit of embellishment as do the green Kraft Core leaves I cut from Tim's new "Spring Greenery" Sizzix die. The metal bird comes from the new Nature Adornments Idea-ology collection. I colored him with some alcohol ink. Chit-Chat Stickers are a great way to add a personal touch with a message or thoughts. I inked each piece with Vintage Photo before sticking them down. Special thanks to our lovely sponsor over at Inspiration Emporium for this first challenge. You can find all of the products I've used on my card at InspirationEmporium.com. Thanks for popping in today. Hope you're inspired to join in the challenge too! Annette beautiful card...my favorite colors. Thanks for sharing the vellum tip. Have a blessed day. Gorgeous card, thanks for the super tip re the vellum!! Lovely soft colours and I LOVE all the embellishments!! How gorgeous is this! Thank you for providing such wonderful inspiration to all of us CC3C participants. Lovely card, great colors! Thanks for sharing your process. Great tips on the velum and flowers! Love the soft colors on this tag, Annette. Beautifully executed! Love the soft lush feeling of your work... so very delicate and sweet.. LOVE it... love the layers also that you have created here... very nice and rich in a soft and alluring way... thanks for sharing with us all. So many amazing elements, it's very inspirational! Beautiful card, lovely colors and amazing details. Congrats on being on the Curiosity Crew. I'm looking forward to seeing more of your wonderful artwork and inspiration. Gorgeous! Love all the little details and the colors!!! Now I think I need to play some more!!! hehehe...I am so happy to be sharing this journey with you and the other girls!!! The link over at Linda's to here didn't seem to work for me....good thing I had your link anyway! I love using velum and I love your new "do" - fits you perfectly! Beautiful. Can't wait to give this a try! Wonderful card with so many techniques, even though all of them don't show. The wallflower paper in the background really set off your card beautifully. I love your beautiful embellishments too. Fabulous embellished card, I love all the different elements. I haven't seen those round blender tools before, they do look good. I like what you did with the roses to make them appear more muted. Yes, I'm inspired - thanks! So pretty, love that shade of blue. Beautiful make and a great tutorial! Loved that trick of the vellum, I definitely will remember that. The finished result looks wonderful, can't wait to start and thanks for the inspiration!! 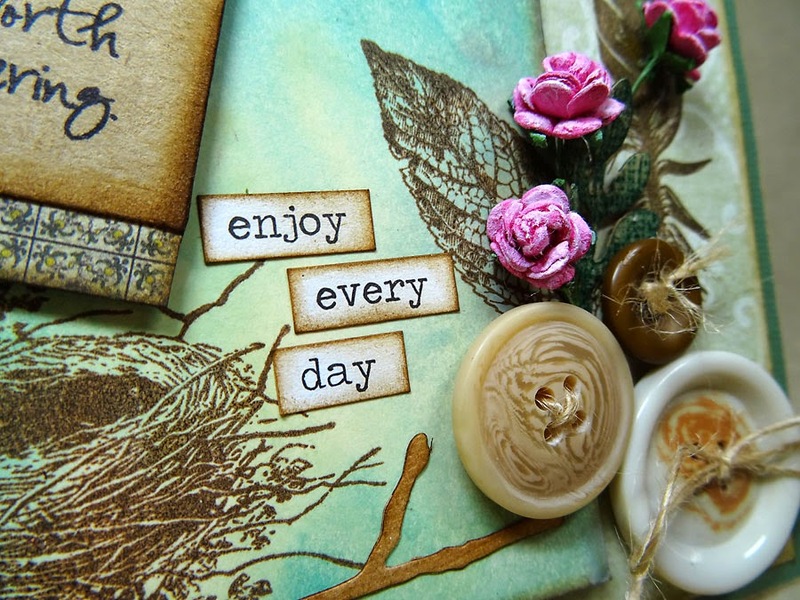 I love the colours you have used and the combination of stamps to make your inspiration piece. The soft colors are so peaceful. Very beautiful. Thank you for the inspiration. so happy i came back to check if it was here yet.. i absolutely love this. the colours are gorgeous, subtle and soft... very very lovely and dreamy. shabby chic. Lovely. I hope to create something half as pretty as yours. Thank goodness for two weeks. So far my marbeling is a blur. Thanks for some great inspiration. So very pretty! Love this challenge! What a beautiful tag/ card. Love it!! This is awesome, Annette! I LUUUUV the Picket Fence Distress Marker on the mini roses! I am doing this now, forever. Love it! Hi Annette -Thanks so much. I love the stamping technique that you shared. Such a gorgeous card. Thanks so much for sharing the vellum trick! That will come in handy! Fabulous card, Annette! I love the colors and all the little techniques y ou used! Great start to the challenge! Love your project! I have been admiring lots of your projects over the past year! I'm still working on my own Halloween "House that Vic built" based on your spectacular house project. Thanks for all the great project ideas and inspiration! I love your take on this technique, Annette! Really feminine and elegant and, well, utterly perfect! I particularly love the colours you used here. What a neat card. Really beautiful! I am loving the new soft paper line too. Lovely! Just says Spring to me. Love the colors you chose for your marbling. Great way to kick off the challenge. Beautiful card! I love the soft blue color. Lovely card, thanks for the vellum trick, and thanks to Inspiration Emorium for the discount they are offering. Lovely soft colours and the sentiments are just right. Enjoy your day! Love all the creative details. Can't wait to get started on this challenge! I love all the embellishments and texture! This is such a lovely soft springtime card. I love the use of the blues and browns! Great beginning to the #CC3 challenge! Beautiful! Love the tag-on-a-tag and how you've added the branch to support the nest. Happy CC3C! very soft and beautiful! i love this one! Beautiful - love that pop of pink! So gorgeous. Love the way you used the technique and combine it with the other elements. I too just love your project. I could see this on an end table in my room. Love this idea of a tag on a tag ... having the sentiment on the mini tag is awesome! Beautiful project! 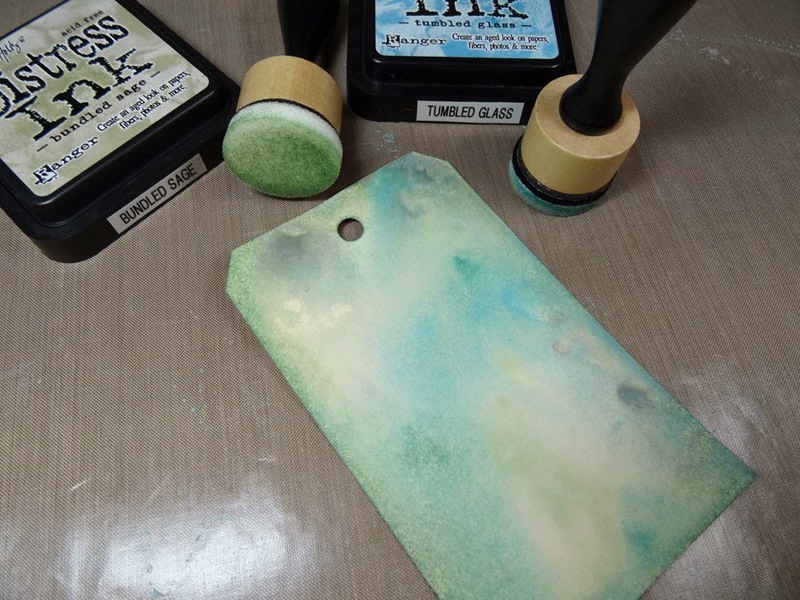 Love the tip for using vellum as a mask to line up stamping on both pieces of paper. Love the details and color scheme of this card. I never know how to add tags to my cards, and you added two! It looks great! Thanks for the inspiration. How lovely - so serene and elegant, Annette! The marbling is absolutely beautiful. This is so apt for this time of year and my most favourite time is spring. Love it. I love the colors of blue .. very pretty project !! Beautiful! Thank you for the vellum tip. Sooo beautiful! Love your vintage buttons and embellishing on this gorgeous tag, Annette! Loved the colors you used. 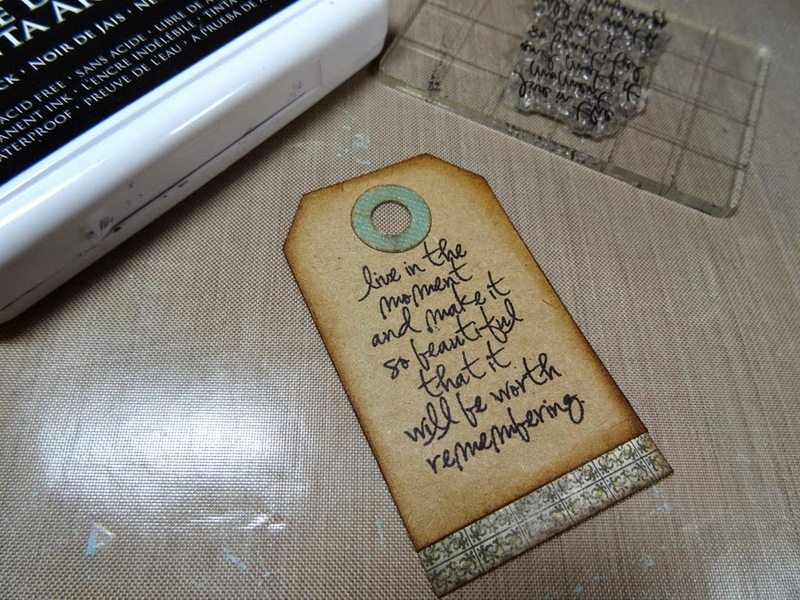 Just bought some of those little Tim holtz tags today. Can not wait to use them. Love your choice of colors & all the elements you used. Beautiful! Very pretty! Looks like a soft"springy" watercolor! Beautiful card! I am a bird-lover so this really tripped my trigger! Super duper! You used one of my favorite sentiments; love it all!! thank you for sharing your tip on how to mute a bright colored flower with the distress marker. I love the sentiment you choose for your card. Soft and sultry are these wonderful Spring colors! Gorgeous embellies too! Fabulous piece! I am so happy to be on this new journey with you Annette! I love the soft colors in the marbling. 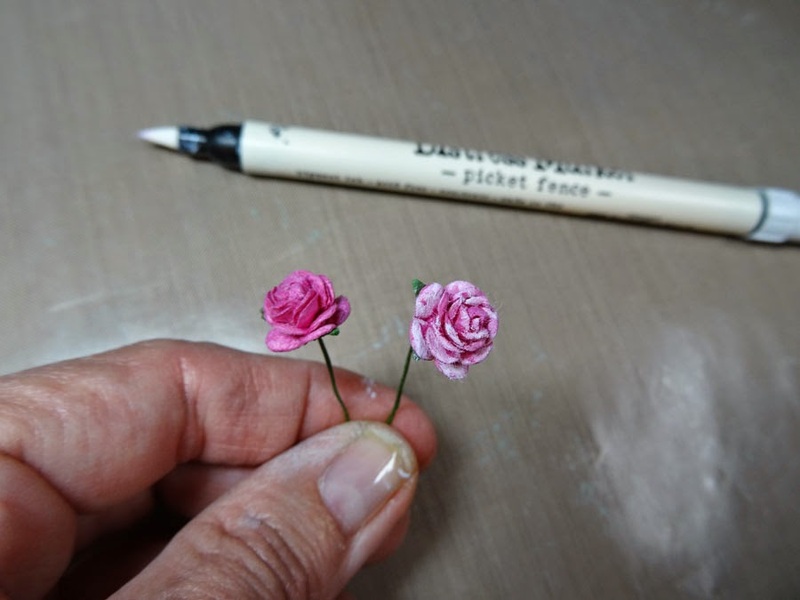 Great tip on coloring the paper flowers! It is time to invest in more Distress Markers! Love your piece, such beautiful muted colours. And the embellishments are gorgeous. I love the soft effect you were able to get with this technique. Very beautiful card. My absolute favourite colour scheme. I love the softness of the images but the vibrancy of the pink flowers. Lovely! 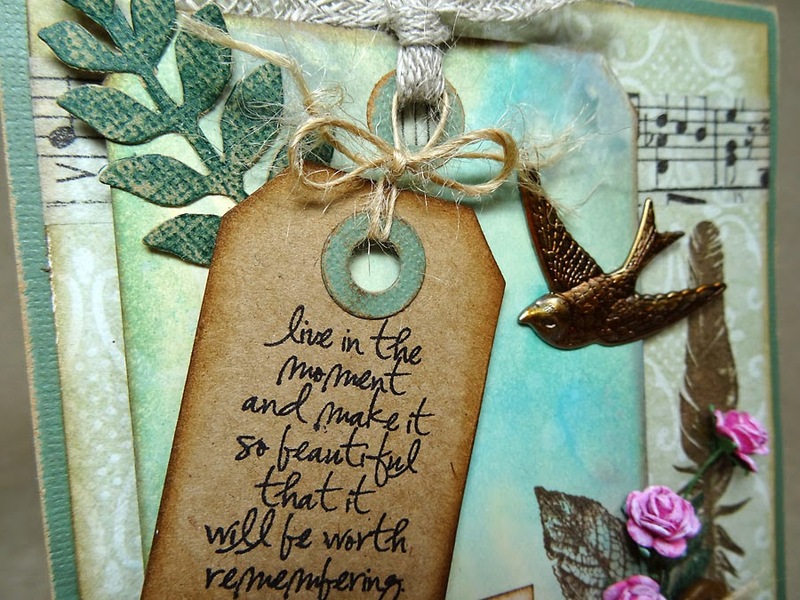 Fab idea to mount the tag on the background and then add a smaller one. Love the colours you've used to marble. Love all the great detail and bird theme. Gorgeous card, grest tip with the vellum! I love the softness of this approach. Thak you for sharing your technique. I love the soft look of this technique. Thanks for sharing your technique. Your card is beautiful! I love the colors, and all the embellishments. LOVE the colors and the bird details and the tag! That vellum tip is so CLEVER! LOVE your card, Annette! Beautiful card! I'm think this challenge is going to be real fun! Very pretty card Annette! Love the soft color palette and metallic embellishments! Your marbled background looks wonderful! Annette this is a fabulous project and I love it. I am very new to it all and just received my cc3 today. I am very excited to play along. Such a gorgeous piece. I love the colours you've worked with. So spring-like. So subtle and so many details, very pretty! Such lovely soft colors. I adore the tag on a tag. The entire thing is lovely. Nice idea of multiple tags. I think its to bad that the paint marbling doesn't look so obvious but over all its a beautiful bright tag. Love the blues, your pretty tags and stampings! Such wonderful soft colors; I'm a pastel kinda gal myself and just love this. The tissue tape adds a wonderful touch! Your card is just beautiful! Love all your embellishments, colors, just love it all!! I love how your elements all work together - it is beautiful. I never thought about using the Distress pens to color my flowers - great idea! Thanks! The background colors on your tag are say spring! What a gorgeous piece of art. I love how you toned down the flowers. Annette, your piece is so pretty- I love softness of it and the blues are just yum! Love your card.. my favourite colors! What a gorgeous card, I love the images from Nature Walk stamp set and how you stamped them to give "continuation" ... that's so awesome!! Love your color choice too and that Wallpaper background paper NICE ... so many great embellishments!! WOW, a beautiful project, most definitely inspiring me! 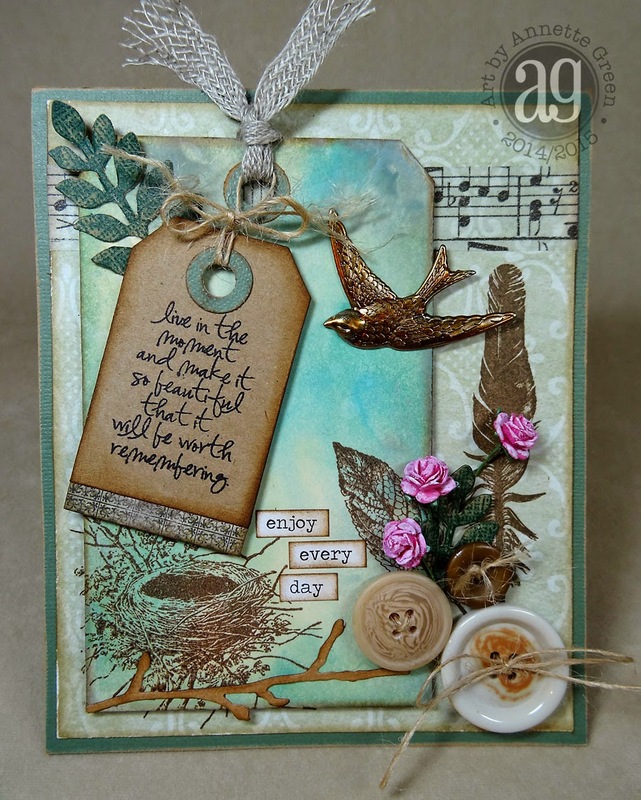 Simply amazing work as always Annette!I love the tag mounted on a card. 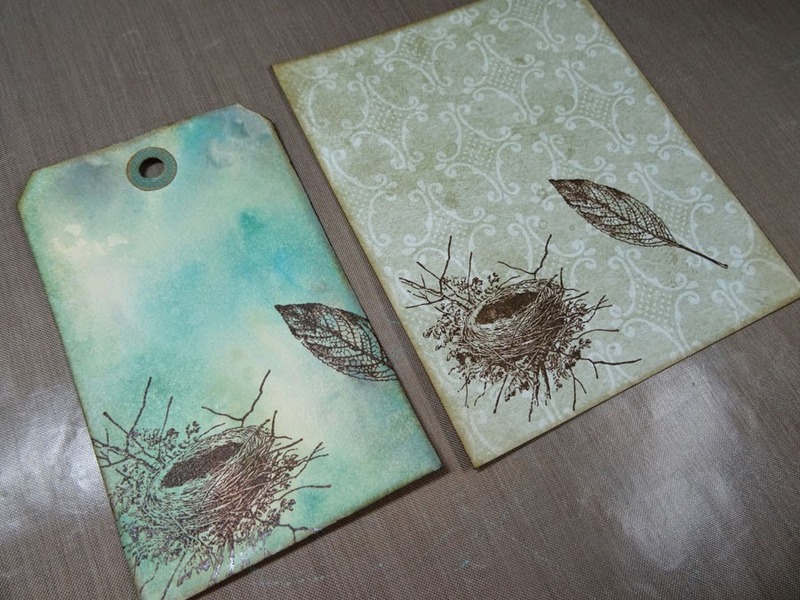 Very clever layering with stamping the image on the card base and then the nest peaks out behind the tag. Wow, beautiful card, there are so much different things to find at your card! Your card is stunning and I love the trick with the vellum for lining up images. I really like the "lighter" and subtler paint marbling look you achieved. Thanks for letting me play along in the CC3C! Here's my first project from his book. This is such a pretty spring composition. Lovely and soft. Lovely blend of colours - I am very inspired by this whole project! Great texture and depth, not to mention the restful color scheme. This is going to be lots of fun!!!! Love it!! Need to buy this blue! Thank you for being part of the CC3C Crew! Your art is gorgeous! so soft and serene and simply fabulous! Love the soft colors, Annette. Such a pretty card! Thanks for sharing how your project came together and what a fab idea for the flowers...it adds such a nice dimension to the roses. Can't wait to try it! This is simply beautiful. great detail. Love the way you altered those flowers with the picket fence marker! That tiny touch of pink with the blues and greens is beautiful! Beautiful! Love your tip with using the picket fence marker - cool effect! So pretty! The soft colors and details are beautiful. Gorgeous spring card! Thank you for sharing your talents and ideas with us! I love your card! It's so beautiful! The combination of turquoise and pink is stunning. Great job!!!! I love this Annette! From your color palette to the stamps you chose, everything just works together perfectly. Thanks for the inspiration! Beautiful card Annette and I love the colors you chose as well! I LOVE this! Using the marker to highlight the flowers was a great idea. This challenge is going to be so much fun! A Very Happy Day Indeed! Have you jumped on the Snapguide bandwagon yet?